The P356 million lotto 6/55 price has been won yesterday, June 1, 2011. Lucky winner on a new moon day! I hope he (she) shares his (her) generosity wisely. And I hope he keeps his winnings for the Philippines rather than putting it on a Swiss or American bank. By allowing his money to grow in the Philippines, he boosts the Philippine economy to something better. After all, the money he won came from millions of Filipinos, both the rich and the poor, from a single sidewalk vendor who saves his ten pesos a week to a wealthy businessman who plays thousands of pesos a month. Regardless, his winnings are indeed very Filipino. So, would it be nice to give back his blessings to his fellow Filipinos by investing his money in the Philippines, creating jobs and employing Filipinos for his business? This is essentially the message of the Parable of the Talents in the Holy Bible. Whatever is given to you, be it talents, skills, knowledge, or money, let it grow and share it with others rather than burying it six feet under. Meanwhile, while we put the lotto 6/55, which has been hot for weeks, to relax, spend time reading this free e-book on how to attract luck. Is it possible to determine where winning numbers might come from? The hot area. This refers to the last 6 draws. If you can see the matrix image above, it is the red area.The fall area. Counting backwards, this refers to the last 7th to the 15th draw. In other words, the next 9 draws prior to the last 6 draws. In the matrix image, these are the yellow and green areas.The cold area. All draw results earlier than or beyond the last 15 draws are called the cold area. In the matrix image, this is the blue area and beyond that. All in all, the results matrix above cover the last 21 draw results. Anything beyond that are numbers in the hibernation period, which is also part of the cold area. Here's a list of Philippine Lotto 6/42 results in the year 1995, the year Philippine lotto started. Are your favorite numbers listed here? If they are, might as well form a new combination. Based on statistics, the jackpot numbers below are unlikely to be drawn again. Any combination of 5 or 4 numbers from any result drawn are also unlikely to win again. Any 5 from the 6-number jackpot can recur only twice, a probability of 1.15%. Any 4 from the 6-number jackpot can recur also with a probability of 0.87%. This is a study on how you can fairly win or unfairly lose from playing scratch-off cards. To win is not the same as to earn or profit. You may win a single card but you still lose a big amount of money. 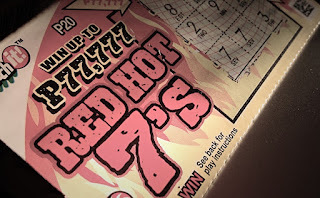 As guinea pig or subject of the study is the Red Hot 7s scratch-it card game being sold by PCSO. At the end of the series, we may be able to theoretically conclude the possibility or probability of winning or losing from playing any scratch-off card games. As a result, this will guide you whether you should continue or not playing any scratch-off game cards. If you want to find out how many cards should you buy to win, go directly to the end of this post.